The Blue Grotto (Italian: Grotta Azzurra) is a noted sea cave on the coast of the island of Capri, Italy. Sunlight, passing through an underwater cavity and shining through the seawater, creates a blue reflection that illuminates the cavern. The Blue Grotto is one of several sea caves, worldwide, that is flooded with a brilliant blue or emerald light. The quality and nature of the color in each cave is determined by the unique lighting conditions in that particular cave. 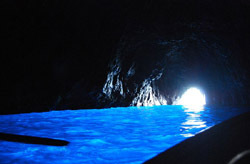 In the case of the Blue Grotto, the light comes from two sources. One is a small hole in the cave wall, precisely at the waterline, that is perhaps a meter and half in diameter. This hole is barely large enough to admit a tiny rowboat, and is used as the entranceway. In photographs taken from within the cave, the above-water half of this hole appears as a spot of brilliant white light. The second source of light is a second hole, with a surface area about ten times as large as the first, which lies directly below the entranceway, separated from it by a bar of rock between one and two meters thick. Much less light, per square meter, is able to enter through the lower opening, but its large size ensures that it is, in practice, the primary source of light.